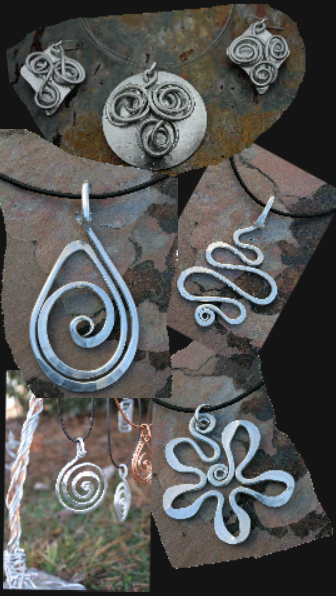 This is really cool jewelry... Each piece is handmade in North Carolina out of light weight, recycled aluminum jewelry, contemporary designs, made in North Carolina. As each piece is handmade, sizes will vary. 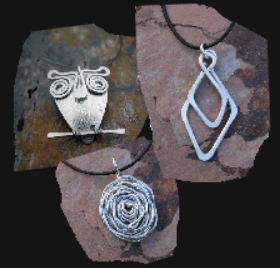 Most designs are offered as a pendant, bracelet, earrings and ring. 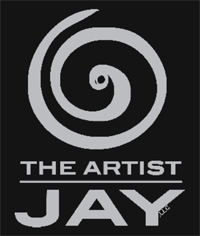 Jay grew up restoring exotic cars with my father in his business. He taught me how to make wonderful things and turn old to new again. My mother is an artist that is a wonderful painter and gave me the talent to imagine and see the designs i now create. With the awesome talents God has bestowed upon me and the help of my parents. We are now making some fun and funky jewelry and stuff for everyone to enjoy. With the help of some very talented local artist, we will be designing and making some great things to come.